One excellent Isagenix product that has proven beneficial in boosting metabolism is Isagenix Thermo GX. If you haven’t already heard about this supplement, now is the time to learn all the important details behind Isagenix Thermo GX and how it can support your weight loss and wellness goals. 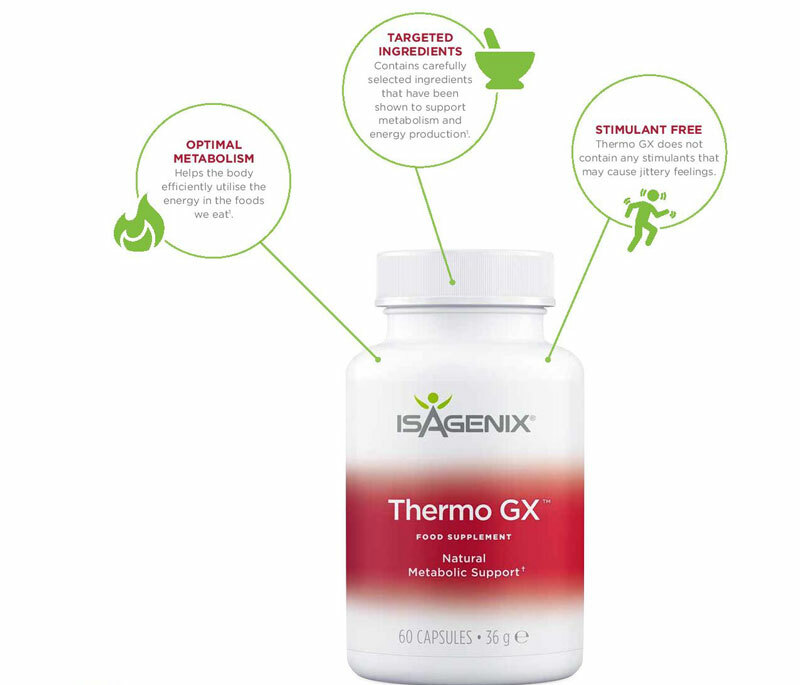 WHAT ISAGENIX THERMO GX IS? Isagenix Thermo GX is an all-natural, stimulant free supplement containing vitamins, minerals, and spices to increase metabolism, aid in weight loss, and boost energy levels. But, to fully appreciate how Isagenix Thermo GX can increase your level of energy, it helps to know what metabolism is and how it converts what you eat into energy. Without using a lot of biological terminology, metabolism is the sum of basic life sustaining physical and chemical conversion of food and fuel into available energy. Catabolism and Anabolism are the two phases of metabolism. Catabolism breaks down the digestion of food and fuel to be released as energy, and Anabolism builds up the consumption of energy and aids in the elimination of internal wastes. The faster your metabolism is able to produce energy, the quicker you are able to burn fat and lose weight. When used daily, Isagenix Thermo GX encourages your body to efficiently speed up its metabolic rate and produce more available energy. The effective energy enhancements developed by Isagenix are the all-natural, beneficial, proprietary combination of vitamins, minerals, and spices to escalate your metabolic rate without the use of stimulants. The advantage of using all-natural ingredients to reduce tiredness and increase mental alertness is what places Isagenix Thermo GX at the top of its field for energy enhancements. Additional advantages of Isagenix Thermo GX over its competitors are that it is soy, gluten, nut, and dairy free, and vegetarian friendly. The majority of other brand energy boosting products relies heavily on the use of caffeine and artificial stimulants to deliver a jolt of temporary energy that leaves you deflated and fatigued when it wears off, and they frequently also deliver the feeling of shakiness or a jittery sensation that interferes with your ability to concentrate clearly. That will never happen with the high quality of ingredients used in Isagenix Thermo GX. Green Tea: A powerful antioxidant to aid weight loss, increase blood flow, and lower cholesterol. Apple Cider Vinegar: A wellness tonic to aid weight loss and reduce high cholesterol. 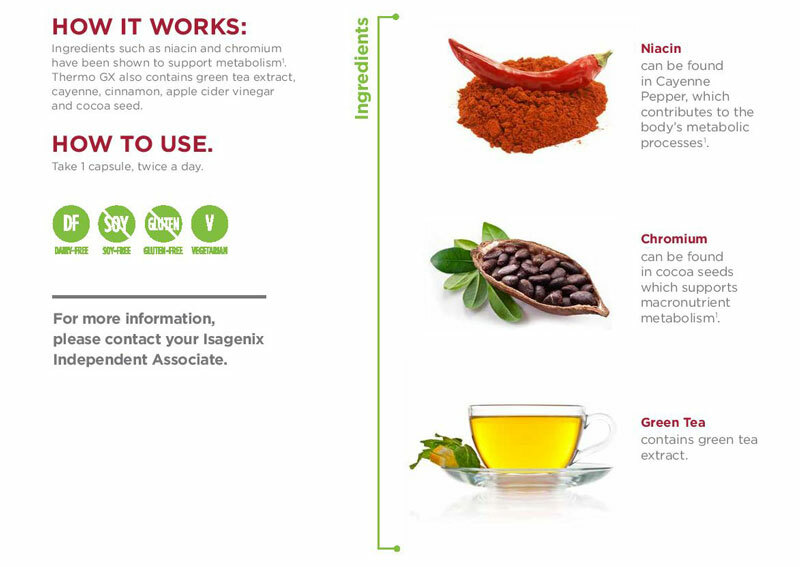 Cayenne Fruit Powder: Aides metabolism breakdown to produce energy. Cinnamon: Aides faster metabolism and supports reduced blood sugar levels. Niacin as Vitamin B3 Niacinamide: Aides macronutrient metabolism. D-ribose: An essential molecule in the formation of basic energy levels. Black Pepper Fruit Extract: A spice that aides digestive functions and increased circulation. Chromium: Aides metabolism breakdown to produce energy. Isagenix Thermo GX is available in a monthly supply of 60 capsules per bottle, and can be added to your automatic shipments. As a daily, nutritional supplement, take one capsule twice daily. Because of the extra energy produced by Isagenix Thermo GX, it is recommended that you take your second capsule 6 hours before going to bed. Take one capsule in the morning with your first meal of the day and then the second capsule in the afternoon with your midday shake or before exercising. 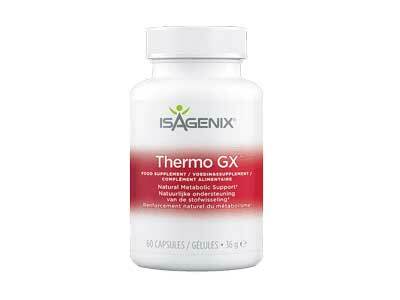 Isagenix Thermo GX is an excellent energy boosting supplement that can be taken as a stand-alone product. However, when used in combination with other Isagenix products for weight loss and nutritional cleansing routines, you will be able to achieve your fitness and wellness goals in a shorter period of time. Now that you know what Isagenix Thermo GX is, how it works, how it can support your health and wellness goals, and how to use it, all that is left for you to do is to take advantage of its benefits. Not only will you love the results that you see in the mirror, you’ll love how you feel.